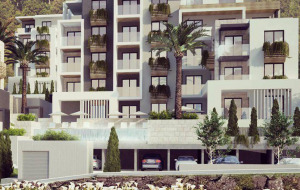 New condo hotel is located on the first line in Kamenovo, the unique place of Budva Riviera known for large number of sunny days throughout a year. Thanks to the well thought architecture, the building organically suits into the surrounding Mediterranean landscape. At the same time most of the observations spots on the territory of the complex have panoramic sea views. Condo hotel has 15 separate apartment units for accommodation of the guests and one penthouse with huge living area. 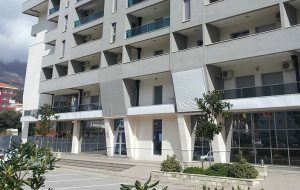 Construction of the building was done using high-quality materials including natural stone and marble with compliance to the European construction standards. 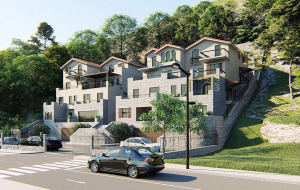 Project design and architecture was made by the team of the famous architect from Belgrade Brano Mitrovic, the member of Serbian Science Academy and owner of numerous awards in the field of architecture. The apartments within the complex have living area from 72 to 479 m2 spread out across four levels (ground floor, first, second and third floors). Every apartment has its own storeroom in the basement with area from 2 to 4 m2. The complex territory has 17 parking places and an additional place for disabled people. On the ground floor there are several facilities for common use of the hotel guests. In comfortable and relaxed atmosphere apartment owners and their guests would be able to enjoy their time in the café bar on the large terrace with panoramic sea view, in the fitness center with Finnish and Turkish sauna and massage room, in the swimming pool with the sea view and on the open plateau for sun baths. From the hotel territory there is a direct access to the sea and further to the great beaches of Kamenovo nearby. The hotel interior is made using high-quality materials of world famous brands. Bathrooms finishing was made with natural stone and marble in the classic style with straight lines, combined with exclusive vanities made by Villeroy & Bosch (Germany) and sanitary fittings made by Dornbracht and Hansgrohe (Germany). All apartments have hard-wood floors Listone Giordano Parquet Heritage Filigrana Firenze and Reserve Mareggiata Oak (Italy). Apartments interior is finalized by ceramics of Graniti Fiandre (Italy). All kitchens are equipped with kitchen appliances made by Miele (Germany) with modern esthetic design.